The Institute of Chartered Accountant Of Pakistan Karachi Sindh. ICAP is planning to establish a Research Facilitation unit (RFU). Based at ICAP Head Office, Karachi and reporting to the Executive Director of Education and Training, the Senior Manager Research will be responsible to set up and operate the RFU. The incumbent will be responsible to carry out research in the fields of Accounting, Auditing, Taxation. Finance. Business, Economics. Technology and other related areas; develop culture and competencies for research amongst members, trainees and students; develop partnerships with local and foreign universities and research institutions; develop indigenous case studies; publish research and facilitate authoring and publishing of research papers and case studies in reputed journals of the field. The RFU shall explore joint M.S/M_Phil/Ph..D programs with the leading universities in Pakistan and abroad to enhance the research capabilities of the Institute and its members. The ideal candidate shall have a doctorate in a relevant discipline from a renowned university with at least two years' experience of working at a leading university or research institution in Pakistan or abroad, designing and supervising research courses/programs, editing research journals, and developing and managing research teams. He/ She must have the ability to write research proposals and win research grants from local and international organizations. The Manager of Legal & Corporate Affairs will report to Director Corporate, Legal and Membership. The position will be responsible to manage all the legal matters of the Institute including coordination with legal advisors and dealing with the legal cases; provide support in keeping effective and efficient liaison with regulatory bodies; provide legal support and guidance to various departments on legal issues and to provide advice on queries of members involving legal matters. The position will also be responsible to attend and deal with corporate matters of the Institute and appear before Courts / concerned authorities to deal with legal matters. The candidate should be a Law Graduate from a well-reputed law school. Candidates possessing foreign law degree will be given preference. The ideal candidate must have minimum 3 to 5 years post-qualification relevant experience of working in a renowned law firm or in the Legal and Corporate department of a well-reputed organization. He / She should have practical knowledge of corporate laws and legal affairs and should possess strong analytical skills, a good understanding of legal language and must have excellent drafting/communication skills. The candidate will be responsible to independently supervise all administrative functions of ICAP Sukkur Office and ensure smooth operational, accounting and administrative activities of the station including managing examinations and maintaining branch decorum. The incumbent should have relevant experience to plan, develop and execute various outreach sessions, career counselling programs and continuous professional development seminars, in order to spread the awareness of CA qualification in Sukkur region. Maintain a good relationship with ICAP members and proactively expedite the quality of services to students along with other external parties including private and public sector within the limits of council guidelines, ICAP policies and procedures. The candidate must have a Master's Degree in Business Administration or Public Administration or equivalent from a reputed University/Institute with at least 3-4 years of relevant experience. Preference will be given to candidates with excellent communication, presentation. administrative and interpersonal skills. 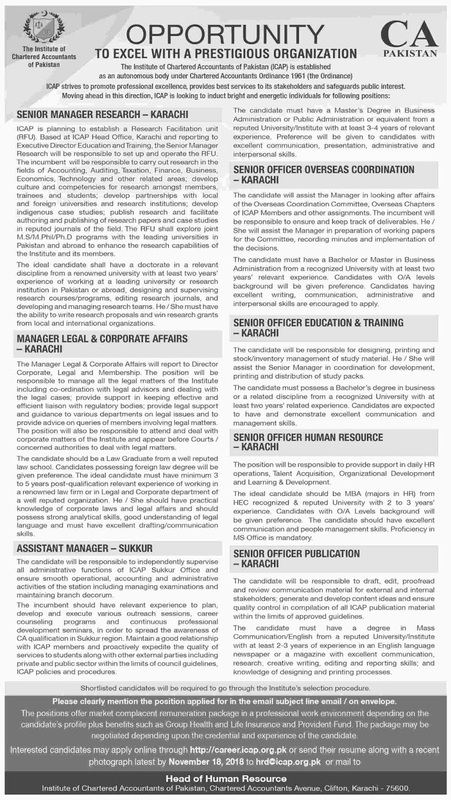 The candidate will assist the Manager in looking after affairs of the Overseas Coordination Committee, Overseas Chapters of ICAP Members and other assignments. The incumbent will be responsible to ensure and keep track of deliverables. He / She will assist the Manager in preparation of working papers for the Committee, recording minutes and implementation of the decisions. The candidate must have a Bachelor or Master in Business Administration from a recognized University with at least two years' relevant experience. Candidates with 0/A levels background will be given preference. Candidates having excellent writing, communication, administrative and interpersonal skills are encouraged to apply. The candidate will be responsible for designing, printing and stock/inventory management of study material. He / She will assist the Senior Manager in coordination for development. printing and distribution of study packs. The candidate must possess a Bachelor's degree in business or a related discipline from a recognized University with at least two years' related experience. Candidates are expected to have and demonstrate excellent communication and management skills. The position will be responsible to provide support in daily HR operations, Talent Acquisition, Organizational Development and Learning & Development. The ideal candidate should be MBA (majors in HR) from HEC recognized & reputed University with 2 to 3 years' experience, Candidates with 0/A Levels background will be given preference. The candidate should have excellent communication and people management skills. Proficiency in MS Office is mandatory. The candidate will be responsible to draft, edit, proofread and review communication material for external and internal stakeholders; generate and develop content ideas and ensure quality control in the compilation of all ICAP publication material within the limits of approved guidelines. The candidate must have a degree in Mass Communication/English from a reputed University/Institute with at least 2-3 years of experience in an English language newspaper or a magazine with excellent communication, research. creative writing, editing and reporting skills; and knowledge of designing and printing processes. Shortlisted candidates will be required to go through the Institute's selection procedure. Please clearly mention the position applied for in the email subject line email / on the envelope. The positions offer market complacent remuneration package in a professional work environment depending on the candidate's profile plus benefits such as Group Health and Life Insurance and Provident Fund. The package may be negotiated depending upon the credential and experience of the candidate. Chartered Accountants Avenue, Clifton, Karachi - 75600.